Discussion in 'Honda Acty' started by shogun, Jul 8, 2016. Unfortunately I do not have the exact angle for the Honda Acty, so I tried to make some adjustment and bent the arm a bit till the noise disappeared. "When checking the wiper blades, don't forget to check the wiper arm as well. It will not be effective to change to any kind of wiper blade if the angle of the arm is not verticle to the front glass. Please check the arm angle carefully when exchanging the wiper blades." See drawing in the link. So basically: bring the wiper up to mid stroke on the windshield and examine the blade assembly. The blades should be making full contact on the windshield and the blade arms should be parallel to the glass. If the arm is bent, use some pliers to carefully twist it until it is parallel with the glass again. Do it trial and error till the problem is solved. One of mine sometimes "chatter" on the upstroke but not returning. Never gave it much thought as it's not that bothersome, but will now check it to see if it is at the right angle. Thanks for posting this. Ohh, I forgot, to bring the wiper up to mid stroke and stop it there: when the wiper is switched on it of course automatically returns to the rest position when switched off. So to stop it 'somewhere': ignition on, switch wiper on, switch the ignition off at the right moment. That are all factory-dealer tools as pictured or you can use a pair of pliers wrapped with several layers of insulating tape. Good find on the workshop manuals. A lot of different vehicles. Yeah. Fred maybe you just need fresh rubber, must bake out over there pretty quick. The blades don't last forever either, once the joints get loose they'll chatter like widows at a funeral. Here in Japan there is a tradition to 'park' the wipers in the upright (lifted off the windshield) position when parked up for more than a day or so. Helps keep the rubber from developing a 'memory' in one position and keeps the wiping edges fresher too. At first I was like 'WTF' but now I do, definitely prolongs the life of the inserts. In winter it also keeps the snow from putting a ton of pressure on the arms/linkages etc. Maybe we try to improve the wiper function. What bothers me always is that there is no interval setting, just on and off. Did somebody already install a intermittent wiper system? 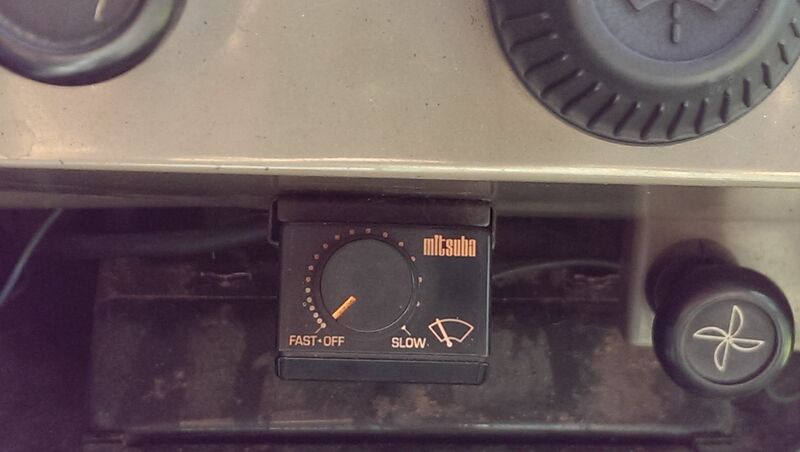 I've had one of these in my '73 Jimny for almost 20 years, still feels and works as good as the day it was new. Super compact, what I'll put in Suz19 when I get some time... definitely proven to be a quality product. Here's the one in the LJ. Paint's faded a little, that's about it. Speaking of wiper arms... note those 40+ year-old originals... What I run when I take it to shows. Maybe the vans have a different system than the pickups as mine has 7 positions to push or pull the stalk to. To the front of the vehicle the 1st is momentary on - makes 1 swing & turns off 2nd position back is OFF, 3rd position is intermittent with long interval, 4th is intermittent with short interval 5th is constant slow 6 is constant fast,& 7 is momentary pulling the upwards toward the steering wheel, it then sprays fluid & makes 2 passes then off. It just occasionally "chatters" on the upstroke when hitting the momentary function and seems to be if I have allowed enough moisture on the glass before moving the stalk. Not really a bother but I will get new refills as they are what came on it when I bought it almost 2 years ago and I have no idea how long it sat so no idea of the rubber age either. Snow was mentioned earlier - makes me cringe anymore. I grew up in the Dakota States(both of them) and learned about driving in snow, putting on tire chains, cold weather, etc, have had fingers, toes, & ears frozen, so I left when I was 18. Other than some time when in the USMC I have pretty much avoided living in snow areas and have managed to do very well without it. Heaviest thing I wear here is a Tee Shirt. When I moved here, I brought along a lightweight windbreaker which I occasionally had to wear in Arizona but I have never needed it here. Two years sounds like a long time to me, especially with all that sunshine. I do mine twice a year, more if one bites the dust early. Winter blades in the cold months are heavy duty, and booted so they don't freeze up. That it chatters on the upstroke makes sense on old rubber; as they 'park' on the downstroke the insert is facing 'up', and they bake into that position on hot days, don't want to flip back over once they harden up. Noticed recently a small problem with the wipers/wiper motor. When I switch off the wipers when the wiper blades are running and halfway down to "home" position, the motor starts to stop, starts again and sometimes stops before going into the home position. Sometimes it works perfect. Seems to be depending on where the wipers are at the moment when I switch the motor off. Normally they should completely go down to home position after switching off. Like as if in some positions there is no power contact on the wiper motor or the multi- function switch. Did somebody also have such a problem and how did you fix that? Either the switch at the steering wheel is faulty (maybe contacts have to be cleaned) or the reason for the wiper blades stopping in the middle is that the stop switch, inside the motor assembly, is not parking the wipers in the required position. I know that from my old BMW, that this stop switch sometimes fails. But not sure if that is the same system on the Acty. Maybe I will try to disassemble the multi-function switch at the steering wheel , if this problem comes more often, at the time it only happens in intervals. Sounds like possibly the old grease in the gearbox is very dirty causing an intermittant interuption of the stop circuit. Might try opening it (if possible, I don't know) and cleaning the contact surfaces and puting in new grease. Normal wiper function works perfect, so that should tell me the grease is o.k. and the motor itself, also high speed wiper function no problem. Only when I switch the wiper off (at the wrong moment/position abt half way down), it starts to stop, move, stop, move and then it goes down to home position. Not a big problem, in most cases it still works as designed, just wanted to be prepared in case it gets worse. I assume it is a electric/contact problem. Edit 1 day later: seems to be fixed. Without key in ignition I switched the wiper lever about 50 times thru all positions. That seems to fix the problem, maybe just some oxidation on the contacts and they needed some movement/cleaning. Drove the whole day and tested many times the wiper as it was raining anyway, always worked fine. Where is the wiper motor? My wipers have stopped working, checked and not the fuse. Looked in shop manual and can't find any reference to wiper motor. Thanks Shogun for the detailed answer. I thought that they would all be in roughly the same place. FYI I have an Acty pickup HA-4. I still have to check the relay (I know where that is) and then to the motor. I'm not looking forward to working under the dash. 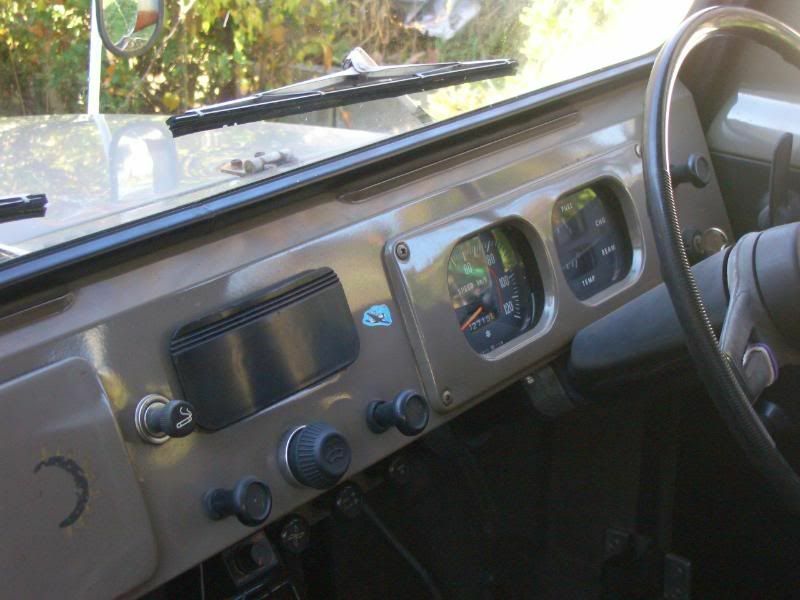 Some years ago I had the dash removed on my HA3 truck without any workshop manual, was not too difficult, took me about 1-2 hour only. Cluster out, glovebox out, center console + radio out and then looking for bolts/screws which hold the dash. Easier than I thought first. Maybe you can find some details in the shop manual. Excellent suggestion. Sounds preferable to trying to crawl under the dash. Thanks again.